Let me break down these red wine veal schnitzels. Today we’re making veal (which is nothing but a younger version of beef) schnitzels (basically just means breaded cutlets), baked in red wine (I don’t need to explain red wine to you). 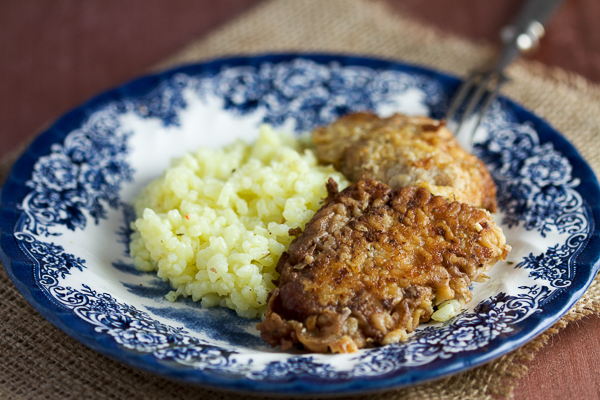 The final result of this seemingly complicated, but in reality easily achieved dish, is tender, breaded veal, with overtones of red wine and garlic. 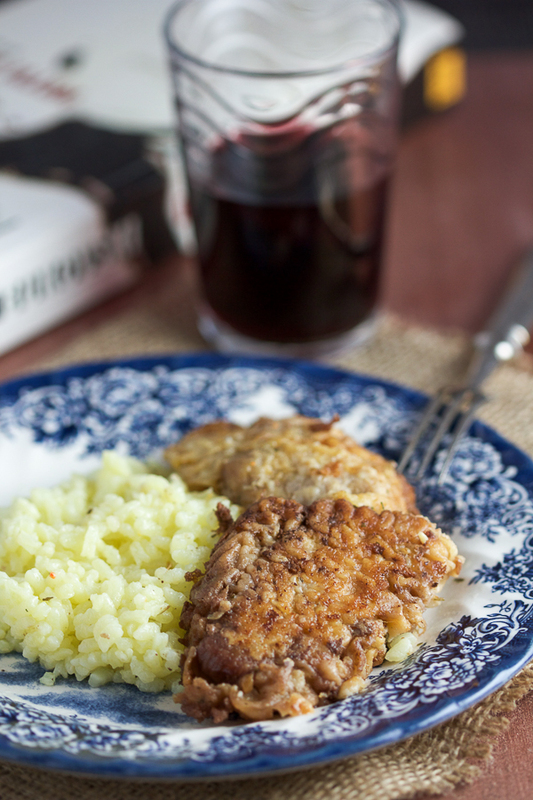 The wine is there to separate schnitzel from the average breaded one. While we are talking about breading, we’re skipping the breadcrumbs altogether, and dipping tenderized veal first into flour then into eggs. We’ll be quickly frying the schnitzels in oil, and then moving on to the most important step. 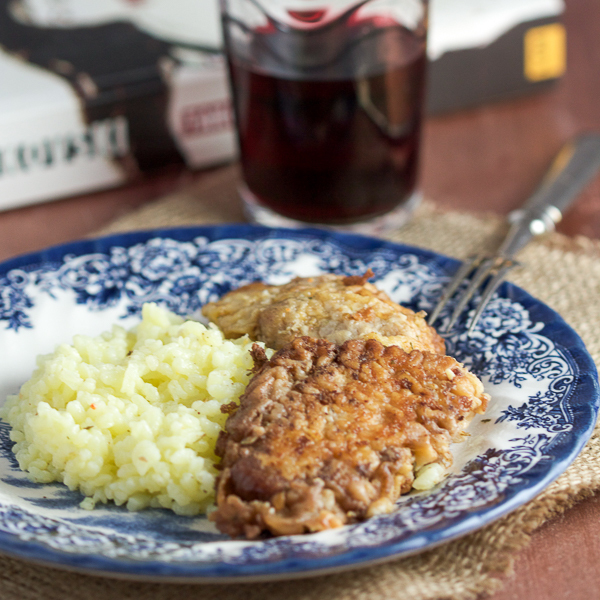 Layering schnitzels in a pan (or a pot), pouring garlic and wine over and baking. Veal made this way is aromatic and intoxicating (no pun intended). This is one sensual meal. And you’re probably not as excited about Sarajevo as I am. But as riddled with problems as this beautiful city is, I’m exhilarated each morning when upon waking I lazily walk up to the living room window to take in the view hundreds of poets have tried to depict with their sweet tongues, but none came even close. But seeing my city in its nakedness, in its perfections and imperfections, its idiosyncrasies which have become synonym with its given name… it’s as close to a prayer as I’ll ever get. By a stroke of luck, I found a place to live right underneath my sister’s. A gorgeous, spacious, Austrian-built flat overwhelmed with light. It’s in the center of the city, but away from the hustle and bustle of main roads, on a road they’ve been fixing every day for months. As everything in Sarajevo, there is no timeline, there is no clear picture when it will be done, just that it’s being done. The neighborhood is too quiet. At first, naively I thought here was a part of Sarajevo where one can relish in the privacy, where no one pays attention, where no one is interested. Soon I realized we were being watched, like the new kids on the block that we were. So we watched the neighborhood back. And quickly those stories started to fall into place, and we got an honest view of our new home. It wasn’t leaning toward good or bad. It was just your typical neighborhood, in your typical city that’s hundreds of years old, somewhere in Europe but fast forwarded to the present. There are families. And numerous dogs that love the corner in front of the building. And a man that just lost his wife whose son wants to sell the house because he found a little flat somewhere else. There is a guy that deals weed, and a rehabilitation center for addicts just up the street. Supply and demand. And a school on the other side of the neighborhood. Then a park with installations. Wine store. French bakery. And a tiny grocery store with every single ingredient you can think of, plus the fresh produce. There is a building that hosts a hair salon with old-school hair machines where my sister got the worst blowout of her life, but she should have taken into account that the only advertisement on the door was “we have grease,” as in the same Grease John Travolta used. There is also a modern hair salon down the street, owned by a gay guy, and although he’s only modestly enjoying human freedoms, its pleasurable to see that there is a place for him too in this new Sarajevo. In short, the neighborhood is like Charlie’s chocolate factory. I chose the place simply. As I mentioned there was a lot of light. Too much light. And I say there is never enough light, so let’s do this thing. But it was really the lady on the window who opened the door. She looked not a day over 78, but was really closer to 96, when I asked for her name, she said the magic word. “Hajrija,” she said. My grandmother’s name. The fate was sealed. Now in addition living in a place, on a road that will be new once they finish it, in this new Sarajevo, I also have my sister living above me. This benefits not only me, but you darlings, because as I’ve said again and again, she’s a whizz in the kitchen. And she loves BLB. So much in fact, that most mornings she’ll text me to say what she’s making and offer her help on the blog. And a lot of times I’ll take her up on it. Like when we have something as delicious as veal that we bread into a schnitzel and then bake in red wine. In a medium mixing bowl beat eggs and mix with vegetable stock powder. Pour flour into another medium sized mixing bowl. Heat a generous amount of oil in a large, deep skillet on highest. Heat oven to 480°F (250°C). Dip each cutlet half first into flour, then eggs. Carefully place into the skillet. Fry and flip after 2 minutes. After about 4-5 minutes in total turn the heat off and remove cutlets from the skillet. 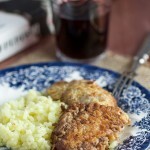 Take a glassware or a baking pan and layer cutlets into rows. (The one used here was a round glassware 9 inches (23cm) in diameter.) In between each row, garnish top of the cutlets with garlic and parsley. After all the schnitzels have been layered, evenly pour red wine over them. Follow up with the broth. Cover the baking pan and place in the oven. Bake covered for 20 minutes. Uncover and bake for 10 minutes more. Serve hot over your side.